Hamas says it has rounded up dozens of Fatah activists in Gaza, a day after a huge rally commemorating Yasser Arafat ended in gunfire killing seven people. Witnesses say security forces opened fire on unarmed crowds after the rally turned into a protest against the Hamas movement's takeover of Gaza in June. 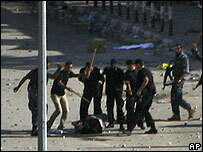 Hamas says its police came under attack from Fatah gunmen and returned fire. Fatah party officials allege 400 of their supporters were arrested and dozens more summoned for questioning. Palestinian Authority President Mahmoud Abbas, of Fatah, compared the rival party's actions at the rally with "crimes of the Israeli occupier". He has declared a three-day period of mourning for the dead and flags flew at half-mast throughout the West Bank, which has remained under Fatah control since the summer's violence. 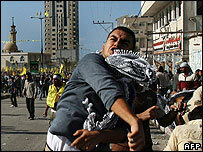 A spokesman for Hamas's Executive Force security teams said troops had detained about 50 Fatah members since the rally. "They are the ones who planned and organised the rally yesterday and are suspected of being responsible for the chaos that took place," Islam Shahwan said. More than 200,000 people attended Monday's rally in Gaza City, making it Fatah's biggest show of force in the overcrowded coastal territory since Hamas took control in the summer. Crowds were dispersing after listening to speeches from Fatah figures now based in the West Bank when the first shots rang out. At one point hundreds of stone-throwing Fatah activists confronted Hamas security forces - despite their rivals letting off heavy bursts of automatic gunfire. The death of Fatah founder Yasser Arafat, on 11 November 2004 from unidentified causes, deprived Palestinians of a key unifying figure. His death was followed by an unprecedented period of conflict between Palestinian factions, especially between Hamas and Fatah following the latter's defeat in parliamentary elections in 2006.